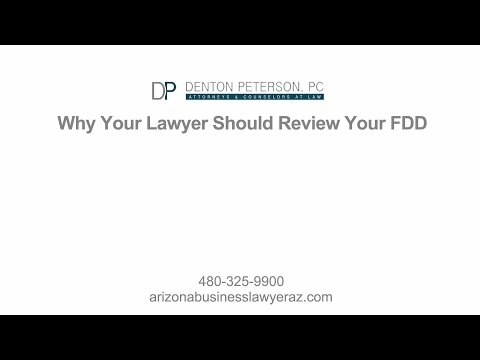 The Phoenix attorneys at Denton Peterson are experienced in drafting franchise disclosure documents. We walk our clients through the disclosure requirements. The franchise disclosure document (FDD) includes 23 items or sections and is a lengthy document. Some of the information required in the FDD is the litigation history involving the franchisor or its officer, disclosure of parent and affiliate companies, initial and ongoing costs of the franchise, training and advertising information, disclosure of current and former franchisees, financing offered by the franchisor, and financial information with audited financial statements. The FDD also includes several exhibits including sample franchise agreements, the table of contents for the operations manual, financial statements, and other sample agreements. We also advise clients about making financial representations in the FDD and the added risks of doing so. We get to know our franchise clients throughout the process in order to make the correct disclosures about their business. After registration is complete, we continue to help our Phoenix franchise clients sell their franchise by assisting in negotiating franchise agreements with prospective franchisees and helping resolve franchisee disputes that arise from time to time. We also advise our clients about their options when working with non-compliant franchisees, including the option of termination. As part of the franchise process, we help clients file for and register their trademarks with the United States Patent and Trademark Office. Our Phoenix franchise attorneys can walk you through the USPTO registration process and help you file the correct applications and documents required.